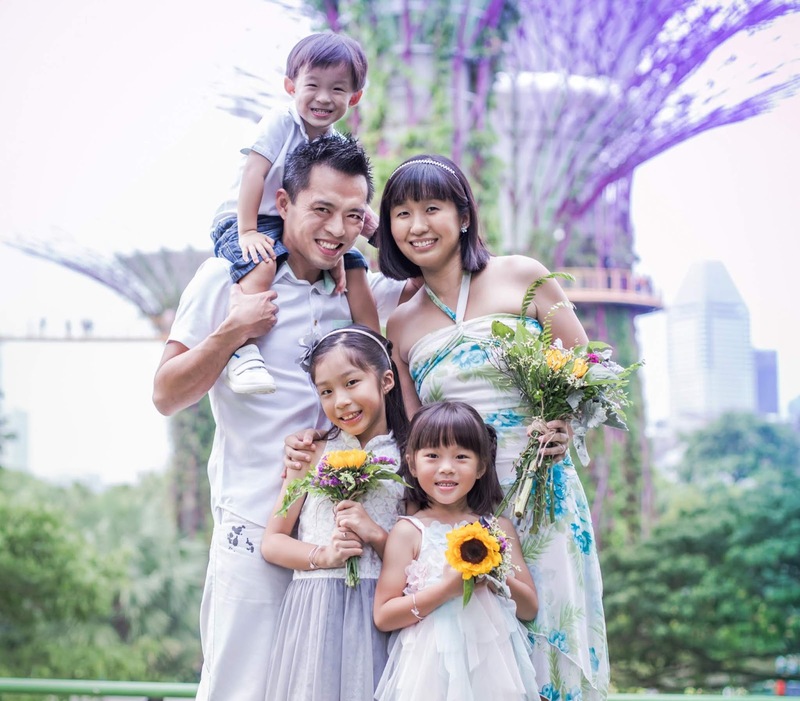 I have always been in love with the Singapore skyline and it's not just because it's beautiful and awe-inspiring, it's more of how I look at it every time and remind myself that I am proud and blessed to be a part of this country. No matter which part of the globe we live in or how far we travel, our hearts are always, and will always, be with this place that we call home. I was half joking when I mentioned to the husband that maybe we should paint the Singapore skyline somewhere in our new house because it would be simply splendid if we could look at it all day long. 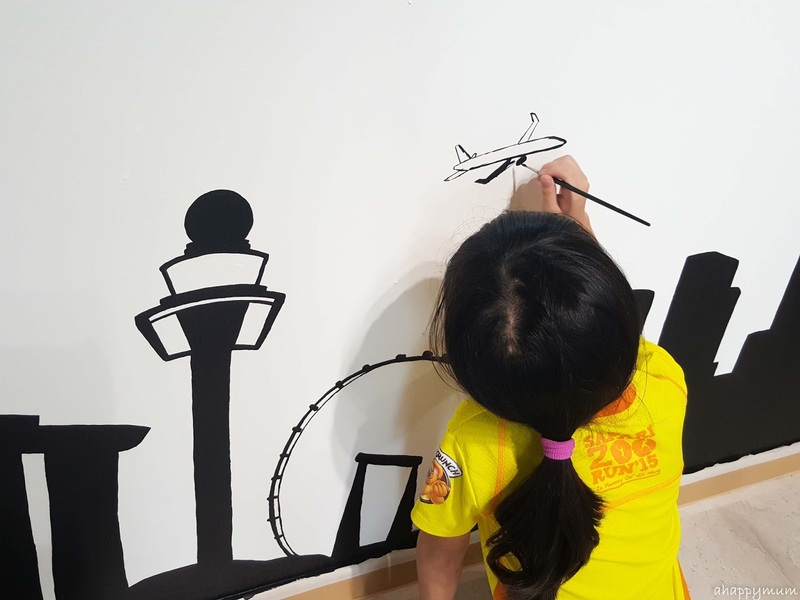 It turned out that we made it come true, even if it was just a small-scaled one, and Angel's art teacher at heART Studio, Teacher Elma, kindly obliged to help us with it. 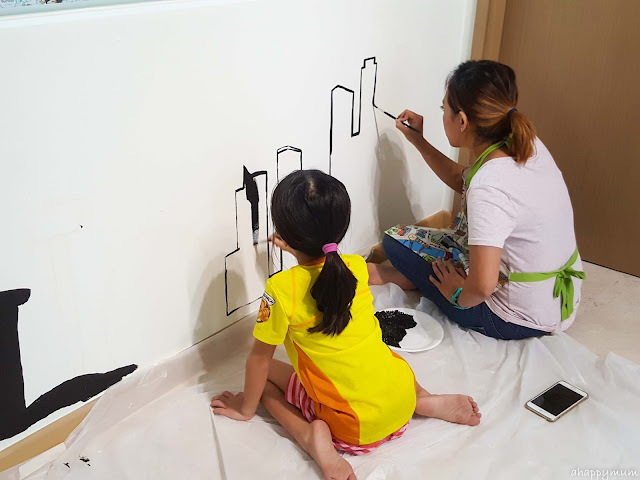 Isn't it just superb that the teacher-student pair got to come together to work on this project? Well, Angel has been with the art studio since she was three and we've definitely come a long way. 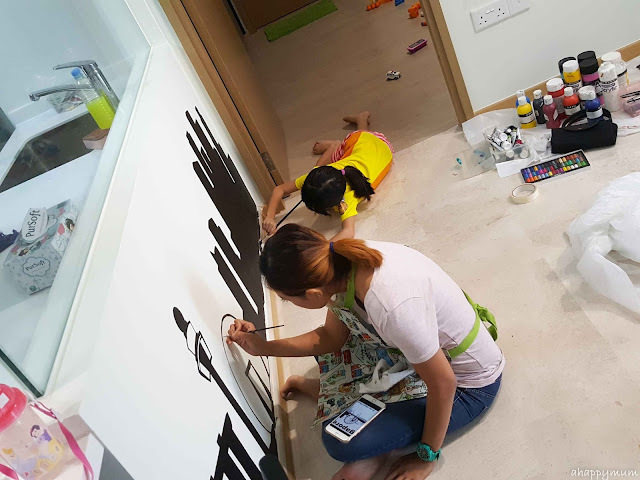 The teachers are more like family to us because we see them every week and we were just so thankful that Teacher Elma and Teacher Syafiq (he is Ariel's art teacher and I'll share more on their project in the next post) reached out a helping hand and agreed to do this specially for us. 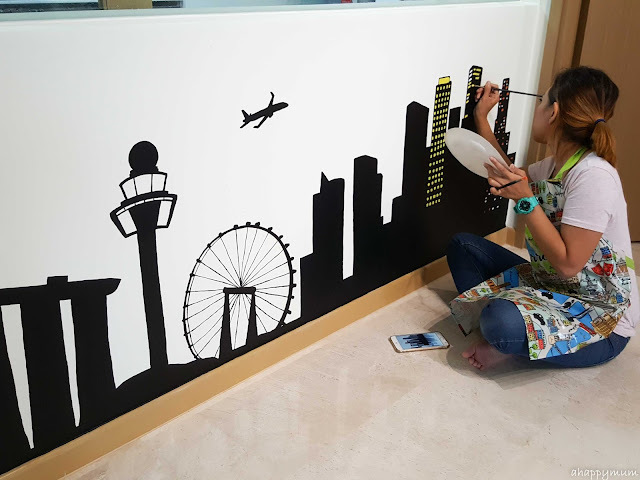 So, in Creativity 521 today, I'll be showing you on how they went about painting this beautiful Singapore skyline and turning our dreams into reality. 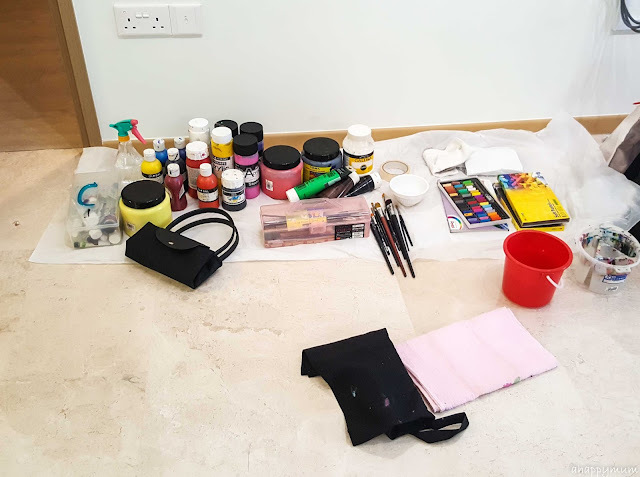 Firstly, the teachers set up a corner for the art materials and look at how much they brought (fyi these belong to them and are their own supplies)! 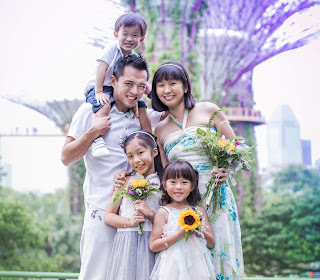 I was feeling relieved that after some inevitable delays, we finally managed to find a date to get together just after Boxing Day, a day after Asher got discharged from the hospital due to pneumonia. Just so you know, we moved in a month after we got the keys to our unit so the whole renovation was really a rushed project and a great responsibility on my shoulders. I was just so, so grateful that things turned out the way we wanted or even better. Despite the lack of time, we still managed to also add in some creative ideas and DIY projects like this made the house feel really, really special to us. So, the first thing we did was to look through some images on Google and decide on the landmarks that we wanted. 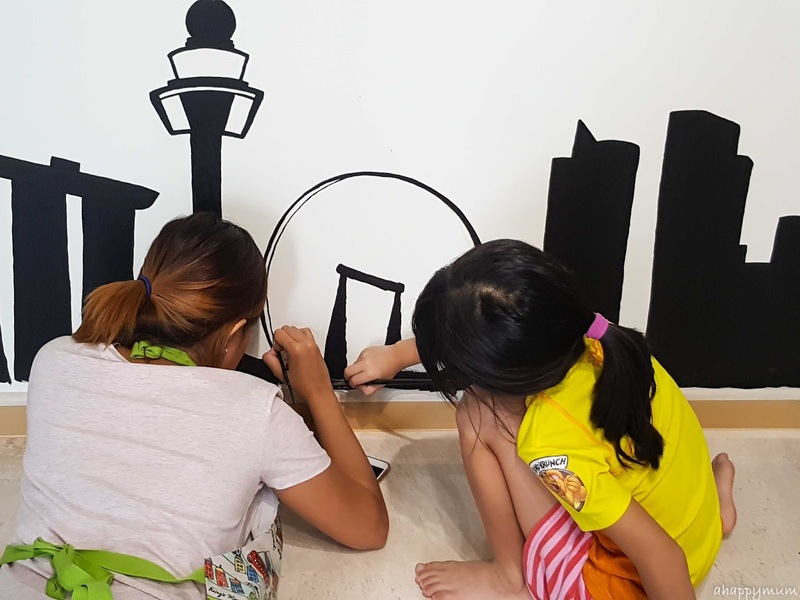 The girls had their say and after a discussion, we decided that we wanted the iconic Marina Bay Sands, the world-renowned Changi Airport, the eye-catching Singapore Flyer and the breathtaking Merlion against the CBD skyline. Considering that we only had a 2m by 80cm wall to paint on, I think that was already a significant number of landmarks. 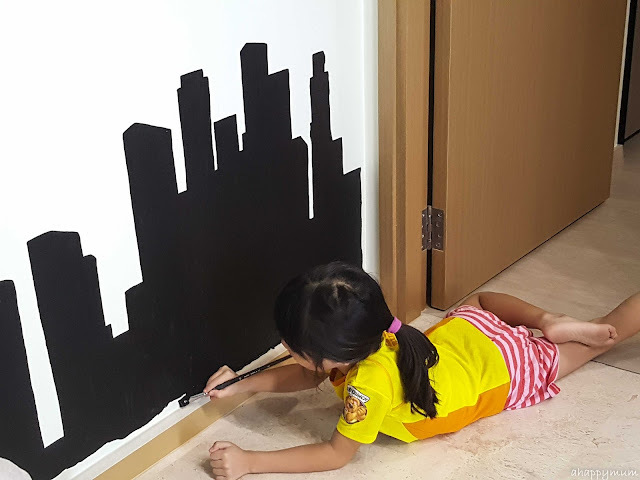 Teacher Elma started off by drawing the outline of the landmarks and getting Angel to fill in with black colour accordingly. Yesh, I wanted a silhouette look because I think silhouettes are just so beautiful and captivating. This made things a little more straightforward for Angel and she didn't have to play around with colours but instead concentrate on painting with big and small brushes. One of the challenges was the Singapore Flyer because with its thin lines and capsules, it would require a steady hand in order to paint it perfectly. 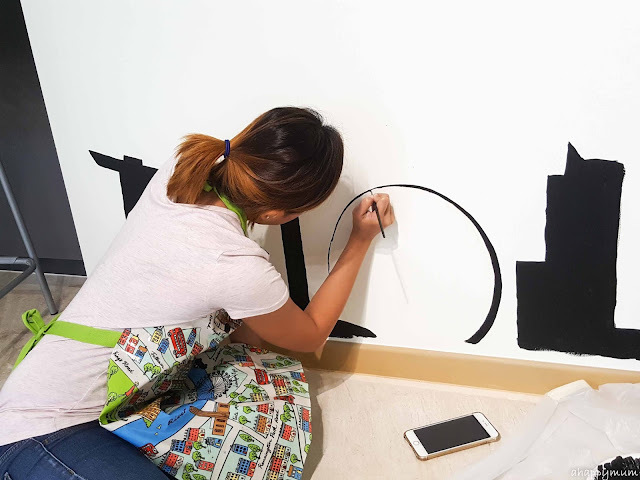 I was quite impressed that Teacher Elma let Angel handle some very small and detailed areas and even more impressed when she managed to do it with patience and precision. Yup, this art lover has definitely improved by leaps and bounds from when she first began. This sight of them working side by side is just so precious and the fact that she helped to make it happen, I think the big girl felt a huge sense of accomplishment and satisfaction. 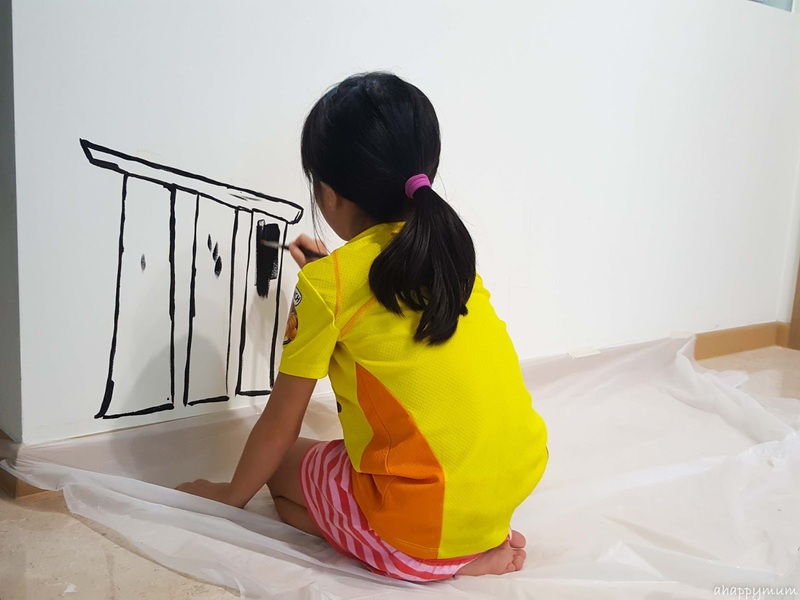 I love that they were involved in the renovation and not just by tagging along with Mama, but also putting in effort, doing paintings, personalising their own beds, helping me to choose furniture etc etc. So how long did the whole painting process take? Well, over half a day. We started in the early afternoon and continued all the way till the sun had already set. At one point, Angel had to lie low on the ground to paint the area near to the ledge and that was really not easy. I think I would have gotten a stiff neck and backache if I were to do it! We wanted to add something in the air and so decided to paint an aeroplane flying away from the Changi Airport control tower. I thought this small plane looked really cute! This was Angel's last task because the Daddy was taking the girls to Universal Studios for the Navy Family Day and unfortunately the baby and I had to sit out because we were really worried that he would fall sick again. So, I stayed on to watch in awe as Teacher Elma did the final part of the painting by adding in the details. Yup, time for some lights! Not just highlights, but building lights too! 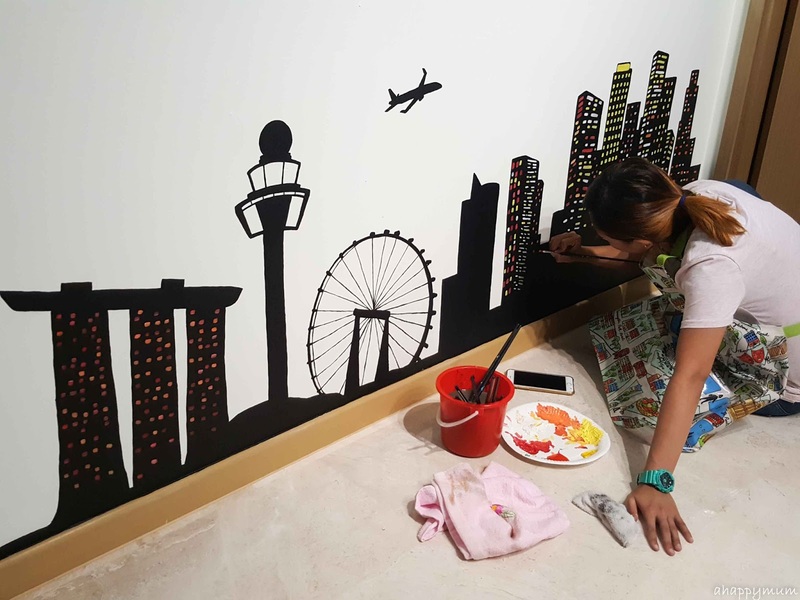 She asked if I preferred uncontrolled (random rainbow colours) lights or controlled (warm colours of yellow, orange and red) lights and I chose the latter since we already had a colourful study area and moreover, this wall mural was part of the Scandinavian-themed living room. See what a huge difference the lights made? I thought they looked so pretty and I admired the patience that she had in painting them one by one and having to keep on mixing and changing colours too. 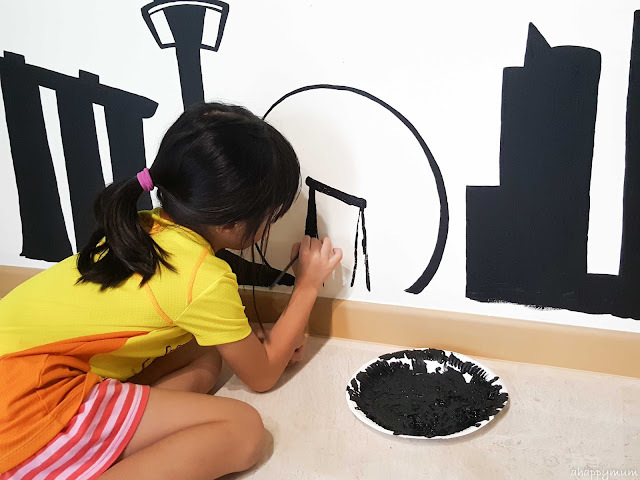 For the final and most important part, she painted the outline of our majestic Merlion in white and it stood in contrast to the black skyscapers in the background. Love it! Ta-dah! 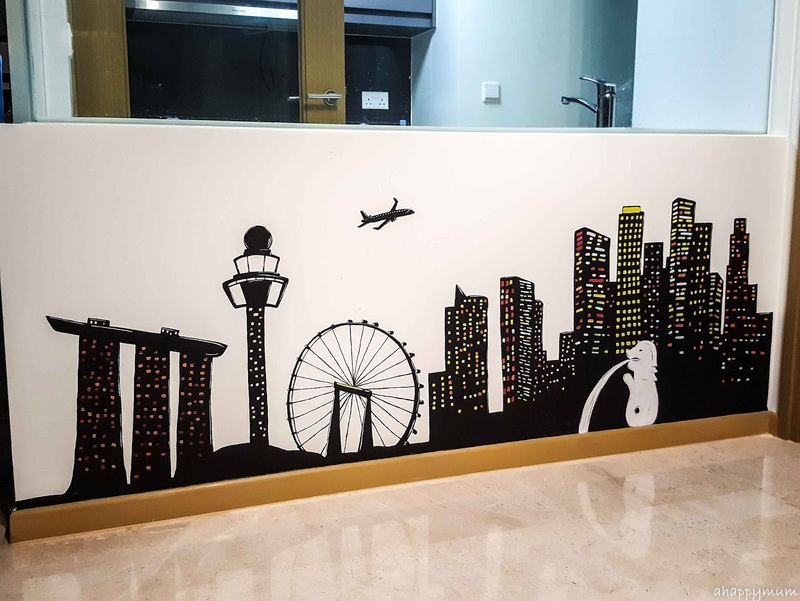 So this is the completed look of our Singapore skyline wall mural and it just makes everything feel so homely, unique and welcoming. 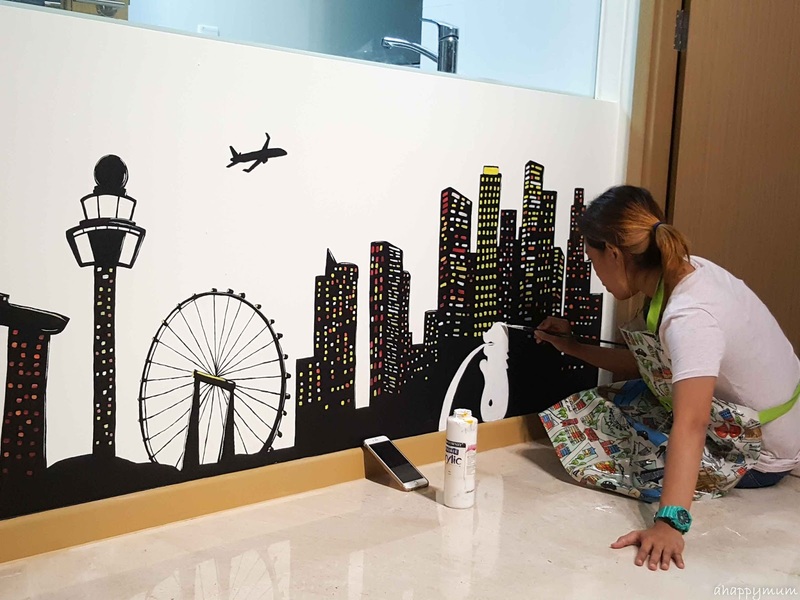 I'm so happy that we did this instead of making a brick wall or pasting wall decals (which were some of the initial ideas) and you bet you are going to see more of it in my posts since it makes such a picturesque backdrop. Till more updates on the house and more DIY inspiration to come!